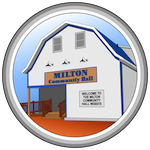 The Milton Community Hall is home to some regular annual events: Dates for 2018 are still tentative. Strawberry Social -Monday July 16 - hosted by the North Milton WI. Summer Card Parties - Thursday Nights throughout June-September, beginning at 7:30 p.m. Cost is $3. Blueberry Social - The St. John's Anglican Church intends to hold their annual Blueberry Social at the Milton Community Hall this year - on Tuesday, Aug 21. Apple (and other fall desserts) Social - Thursday, Oct 4th from 6-7:30 p.m.
Christmas Craft Show -Saturday, November 24, 2018 9:30 -3:30 p.m. Admission $2 for those over 12. Community Council meetings are now meeting on the 3rd Wednesday of each month at 7:30 p.m. Council meetings may not be held in December, July or August. Fitness for the 50+ Classes are being held on Mondays and Fridays from 9-10 a.m.. Cost is $3/class or 2/$5. Coffee Club - Drop in on Mondays and Fridays at 10:00 a.m. for coffee and usually some treats.... Admission by donation of coin or snacks! Open Bible Baptist Church- The church rents the hall on Sundays (morning and evening) and Wednesday evenings for their weekly services. The hall would like to start Crib Nights on Thursday evenings. If you might be interested in attending, or helping to organize these evenings – can you please contact the hall at 902 566-3154.